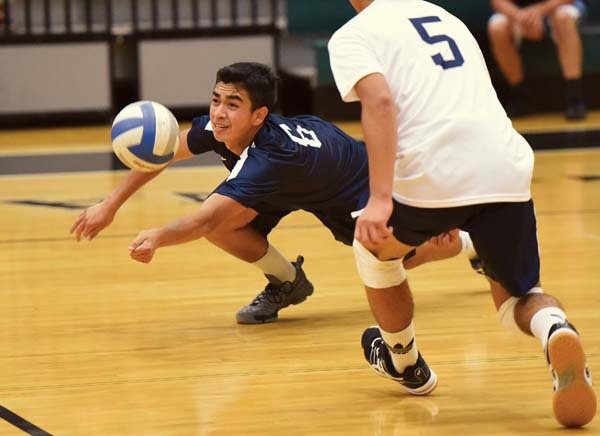 Austin Peters grew up watching the Kamehameha Schools Maui boys volleyball team. Michael Sterner always wanted to be a big part of the Molokai team. This season, they each helped their teams to Maui Interscholastic League crowns and are the coaches’ choice as MIL Players of the Year. Peters, the Warriors’ junior setter, quarterbacked Kamehameha Maui’s climb back to the top of the MIL Division I ranks, leading the Warriors to the title for the first time since 2009. In his senior season, Sterner, an opposite hitter, was a major part of the Farmers’ second straight MIL Division II championship — they returned to the state semifinals a year after finishing second. Peters is joined on the D-I first team by teammates Keahi Jacintho and Hanalei Alapai, King Kekaulike’s Nakuluai Morando and Ian Martins, Maui High’s Noah Rohozinski and Lahainaluna’s Pono Murray. Peters is the only non-senior on the first team. 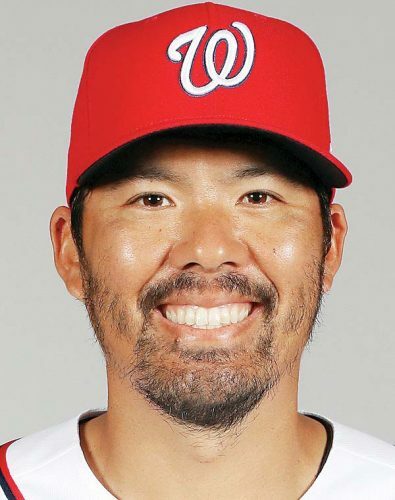 “We just have to work just as hard (next year) as we did this year, fill different positions, do different things, and hopefully we can continue our success,” said Peters, who is also an all-star in the classroom. He will take this summer to plan out a college path and see “if sports is in the mix or not.” He took Advanced Placement biology, psychology 100, and sociology 100 as a junior, and plans to take AP calculus, AP physics, English 100 and statistics 100 as a senior. He is also the starting point guard on the Warriors’ basketball team. 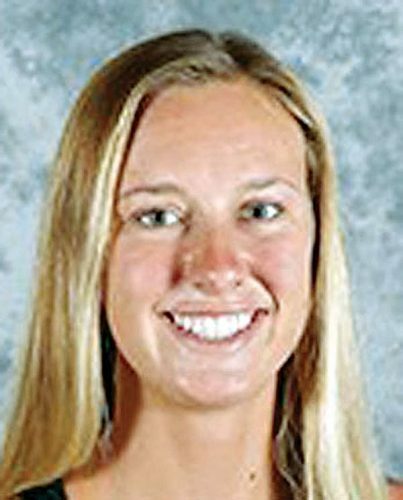 “I love both of the sports I play and if I do one of the sports in college, it would be more of an addition to my schooling because that’s my first priority, so I would play either one because I love them both,” said Peters, who holds a 4.0 grade-point average. Kamehameha Maui’s Robert Brede and Molokai’s Hale Domingo were the choices of their peers as MIL Coaches of the Year. Sterner plans to attend Minot State University in North Dakota and walk on to the basketball team. He will go to school with his wife, Gellyann Ringor-Sterner — the couple wed on May 27. 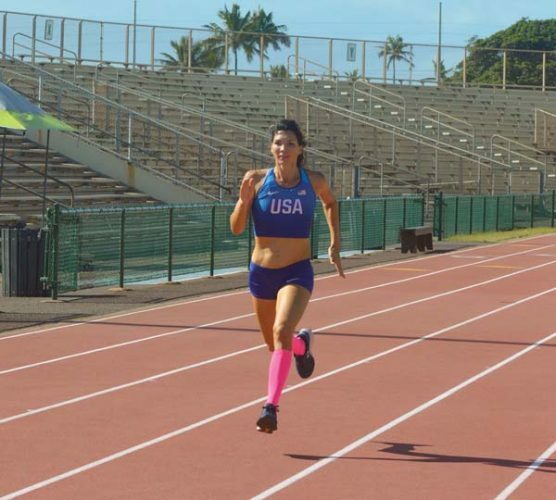 Sterner said he will miss the island of Molokai and Farmer athletics. He is joined on the D-II first team by teammates Kawena Augustiro and Kaina Adolpho, Seabury Hall’s Ian Roth, Mohalu Aikala and Erickson Shull, and Hana’s Napono Lecker-Tolentino. 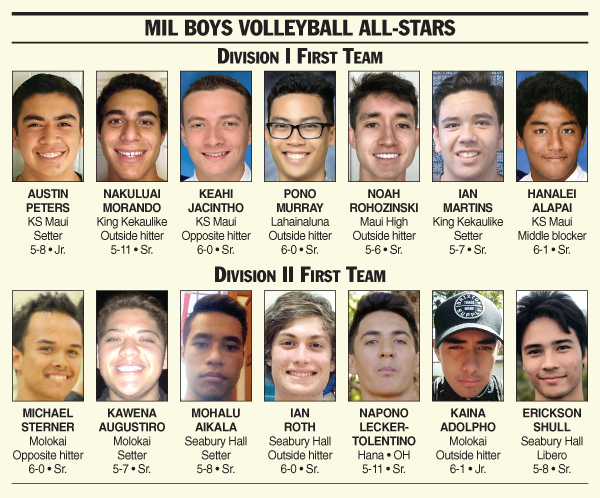 Jonathan Aunese, Maui High, Outside hitter, 6-1, Jr.
Tristan Hooper, King Kekaulike, MB/OH, 5-9, Sr.
Isaiah Faria, Baldwin, Libero, 5-7, Sr.
Andrew Ordono, Baldwin, Setter/opp, 5-9, Jr.
Reilley Marrs, King Kekaulike, Setter/OH, 6-0, Jr.
Haweo Johnson, KS Maui, Outside hitter, 6-2, Sr.
Joey Sigrah, King Kekaulike, Middle blocker, 6-2, Sr.
Yosef Moeai, Hana, Setter/OH, 5-10, Jr.
Kainalu Kubo, Seabury Hall, Outside hitter, 5-11, Jr.
Lekili Burrows	Molokai, Middle blocker, 6-1, Sr.
Leonard Valdez, Lanai, Outside hitter, 5-9, Sr.
Keison Poaha Alcon, Molokai, Setter, 5-9, Jr.
Keoki Hoopai-Waikoloa, Hana, Middle blocker, 5-11, So. 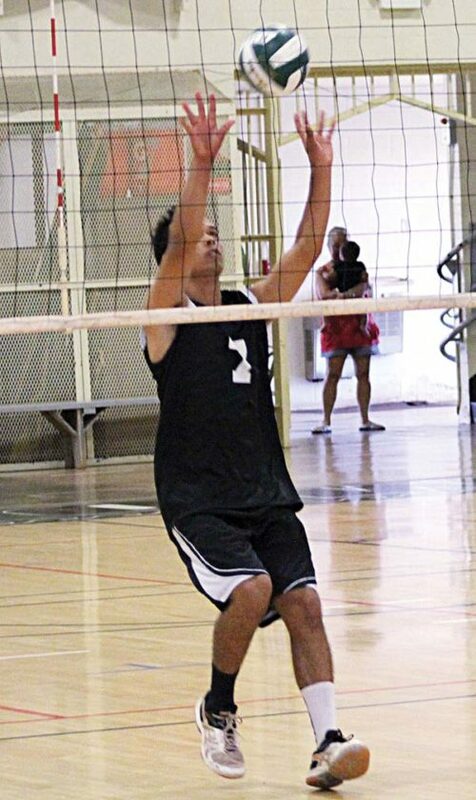 Peter Keliihoomalu, Molokai, Outside hitter, 5-10, So. Division I–Baldwin: Mango Finau, Joshua Ibuos. Kamehameha Maui: Keo Chun, Hanalei Hoopai-Sylva, Tyson Haupu, Rafael Adolpho. King Kekaulike: Zayden Mokiao. Lahainaluna: Jeremi Santos, Carter Stockham. Division II–Lanai: Ian Viloria. Seabury Hall: Noah Bigelow.